Leather Furniture - keeping it looking good for longer! [email protected] | The Most Thorough Clean You’ve Ever Seen Or It’s FREE. Blog Leather Furniture - Careclean's top maintenance tips! Leather Furniture – Careclean’s top maintenance tips! Comfort – leather adjusts to your body temperature, making it super comfortable to sit on! Price – leather is now more affordable and there are sofas and furniture to suit all budgets! Sounds good right? So, how do you care for your leather furniture? Cleaning is an essential part of caring for your leather furniture. It not only removes dirt and oils (which can, over time, break down the leather’s protective coating) but will also help to maintain the moisture balance in the leather. This is important for keeping the leather supple and as a result makes it less likely to absorb spillages. In addition a protection treatment will keep it cleaner for longer and help to remove stains easier. 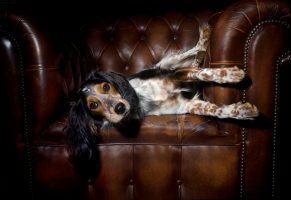 So how do I maintain my leather furniture? The MOST important thing about leather is not to let it dry out. If this happens then the leather will crack! Let’s not forget that leather is an animal skin, so just like our skin, it needs moisture to keep it supple! Conditioning your leather is very important in ensuring that your leather will last a long time. Another really important way of maintaining leather is by having it PROTECTED… just like carpets and upholstery, leather will stain, especially if it has started to dry out and crack. Unprotected leather has no barriers against stains such as: tea, coffee, wine, ink, nail varnish and denim dye transfer from your jeans! Do you want to give your leather furniture a little TLC? Careclean both CONDITIONS and PROTECTS your leather furniture when you book a clean with us. Read more about our leather cleaning on our webpage, or give us a call on 01245 323989 to book in your free cleaning quote. Careclean was established in 1984 and has a vast knowledge of carpet and upholstery cleaning and maintenance. We post a weekly blog, which often includes carpet and upholstery cleaning tips and guidance on keeping your home clean and healthy. Click here to check out our blog. You can also follow us on Twitter and Facebook to keep up to date on all the latest news and offers. Have You Seen Our Fabulous Offers?